There is something special about the mystique of the Pomona Fairplex in November. 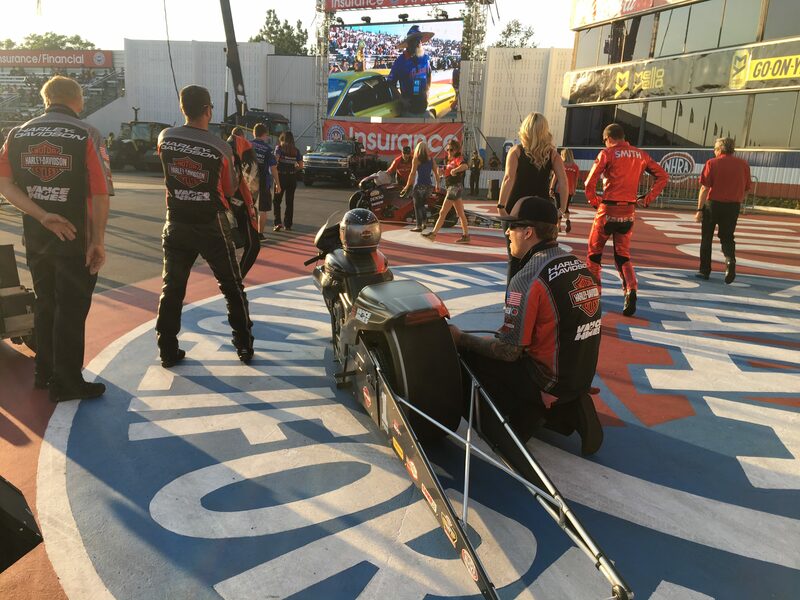 The NHRA World Finals once again lived up to its billing with a jam-packed crowd and an exciting fight to the finish in Pro Stock Motorcycle. Enjoy and share some video and photo coverage featuring PSM and the bracket finals. There are more videos on the Cycledrag Youtube channel (please subscribe here) and the Cycledrag.com Facebook page (Please like here) and more will be coming soon. Matt Smith scored $75,000 for his big win. Matt and Angie Smith celebrate with a victory kiss. Matt Smith’s machine was in the winner’s circle for several hours. There were many photos that needed to be taken. “Fast” Fred Camarena Made the Show in the No. 15 spot. The Harley-Davidson legend Willie G. Davidson and his wife. John Force has his own Media Center! The very first rider of the Vance and Hines V-Rod GT Tonglet cheering on his brother LE. Five-time series champion Andrew Hines qualified in the No. 4 spot. Angie Smith checks her phone moments before a run. Was she checking out the Cycledrag.com Facebook page?